When there’s a chill in the air, getting out of bed in the morning can be a challenge. But we’re pretty sure these delicious breakfast recipes will help get your day going faster. When was the last time you treated yourself to crepes for breakfast? This decadent recipe comes from Quebec’s second-largest maple syrup-producing region. 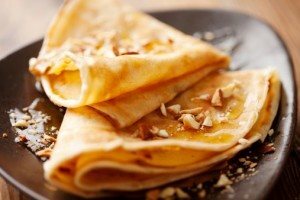 These crepes are simple to make, and they’re loaded with maple sugar and syrup. They’re not only great for breakfast, but they can make an impressive dessert as well. For the recipe, go here. There’s nothing like a breakfast bake to power you through the morning. This one is loaded with swiss cheese, tomatoes, zucchini and herbs. And you can make it ahead of time and reheat in the morning. Yum!Get the recipe here. If you’re a fan of these sweet and tart berries, you’ll love this treat, which also features cinnamon and walnuts. You can easily turn this cake into muffins too. You’ll find the recipe here. With 30 grams of protein and more than 7 grams of fiber per serving, these pancakes are guaranteed to fill you up. They’re healthy, quick to make (5 minutes of prep time!) and taste delicious. Get the recipe here. This vitamin-rich blend of apples and potatoes is both healthy and tasty. Onions, thyme and paprika give it a little kick. You can even add bacon if you want. You’ll find the recipe here.